The first major radio telescope to be built in Britain for decades, LOFAR (Low Frequency Array) that will help answer questions such as "are we alone?" and "how did black holes grow in our universe?" 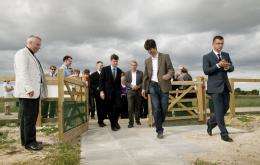 has been officially opened by Dame Jocelyn Bell Burnell at a ceremony at STFC's Chilbolton Observatory in Hampshire. (Monday 20 September). The telescope, which is part of the European LOFAR project will 'listen' to the Universe at FM frequencies, helping astronomers detect when the first stars in the Universe were formed, to reveal more about how the Universe evolved. During the ceremony, guests were able to observe a pulsar in real time using the Chilbolton station; Dame Jocelyn Bell Burnell discovered the first radio pulsars, so it was most appropriate for her to perform the opening. Professor Rob Fender of the University of Southampton, Principal Investigator of the LOFAR UK project said "The most amazing thing is that these small dipole antennas can pick up faint radio signals from over 10 billion years ago, when the universe was a fraction of its current size, and that this signal can be mapped over the entire sky by the telescope without a single moving part." LOFAR is a European project being led by ASTRON (the Netherlands Foundation for Research in Astronomy) which when complete, will see over 5000 separate antennas grouped into 'stations' all over Europe, including the Chilbolton Observatory to form the world's largest and most sensitive radio telescope. LOFAR works at the lowest frequencies accessible from Earth which, combined with the latest in high-tech computing, allows wide areas of the sky to be surveyed opening up new possibilities for astronomers. The installation of the 96 telescope radio antennas that make up the Chilbolton station was completed by scientists from a consortium of universities involving a large number of students. Derek McKay-Bukowski, Project Manager at LOFAR Chilbolton for STFC/SEPnet, said; “The team working on the project have been great. We've had the best of UK scientists and engineers, but also lots of university students too. For them, it has been an amazing learning experience." The opening ceremony at Chilbolton Observatory preceded an event at INTECH Science Centre, Winchester, where guests were invited to hear a series of presentations from members of the LOFAR community, STFC and ASTRON followed by a live Planetarium show highlighting the LOFAR capabilities presented by Dr Jenny Shipway, INTECH Planetarium Manager. At the INTECH event Professor Mike Garrett, General Director, ASTRON said "The International LOFAR Telescope is opening up a new window on the universe - there is a lot of excitement about just what we are going to discover. The LOFAR station in Chilbolton, will double the level of detail we will be able to see in the images LOFAR will produce. It's also fantastic to have the UK astronomical community fully onboard - they will help ensure that this transformational new telescope is fully exploited scientifically - we're looking forward to the first results". LOFAR UK is funded through a collaboration of UK universities with the SEPnet consortium and the UK Science and Technologies Facilities Council which includes RAL Space at STFC's Rutherford Appleton Laboratory, STFC's UK Astronomy Technology Centre and STFC's Chilbolton Observatory. The Epoch of Reionisation - understanding how the first stars and black holes made the universe hot. Extragalactic surveys - what is the history of star formation and black hole growth over cosmological time? Transients and Pulsars - probing the extreme astrophysical environments that lead to transient bright bursts in the radio sky. Cosmic rays - what is the origin of the most energetic particles in the universe? Solar and space environment - mapping the structure of the solar wind, how it relates to solar bursts, and how it interacts with the Earth. Cosmic Magnetism - what is the origin of the large-scale magnetic fields that pervade the universe?